We are delighted that you are considering First United Methodist Church in downtown Palo Alto for your next concert. 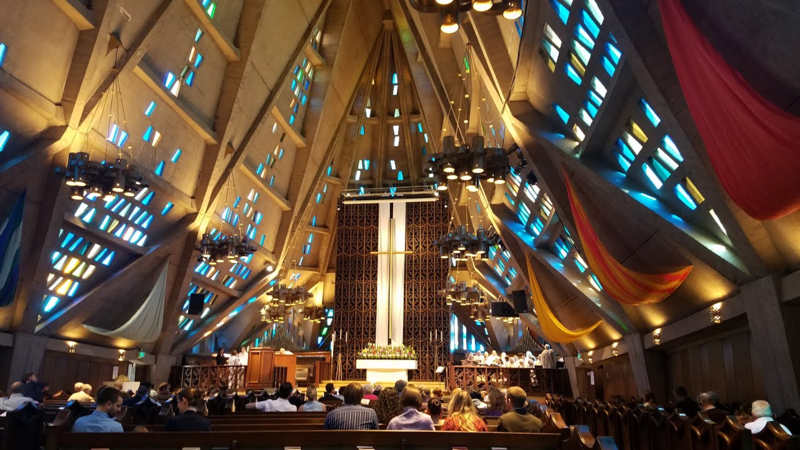 With its soaring ceiling, dramatic architecture, great acoustics, Bosendorfer grand piano and magnificent Merritt Speidel Organ, our sanctuary offers a wonderful venue for your concert. Located close to restaurants with ample parking around the church and in the public lot on Webster, this is an ideal location. The Sanctuary has a total seating capacity of 650. This includes seating in the balcony as well as on the main floor. We have the ability to install a stage over the chancel steps, as we do for such groups as Philharmonia Baroque Orchestra, and the San Francisco Chamber Orchestra. We provide risers for choral groups, a limited number of music stands, and a conductor’s podium. A $400.00 non refundable deposit must be made when the concert is scheduled. The sanctuary fee is $1,100.00 for 6 hours with access normally from 5 P.M. until 11 P.M. for a concert, and includes a room for the conductor or soloist, and one large green room, Kohlstedt Hall. For a separate rehearsal, 4 hours from 6 P.M. until 10:00 P.M., there is a fee of $250.00 for the sanctuary and $100.00 for the custodian. If you require additional rooms, the charge is $55.00 per room. If you require more than the pulpit and lectern microphones, you need to have a sound operator which is $35.00 per hour. Piano tuning, if requested, is $300.00, and must be performed by our technician. To schedule a concert or a tour of our facilities, contact Jerry Johnson, Concert Coordinator, at jerisings@aol.com. We would love to share our exciting facility with you.